Who needs last minute christmas shopping/preparation when you can go skiing instead? Unfortunately the Alps have been having a bit of a snow drought during the last month, as well as it being early in the season. 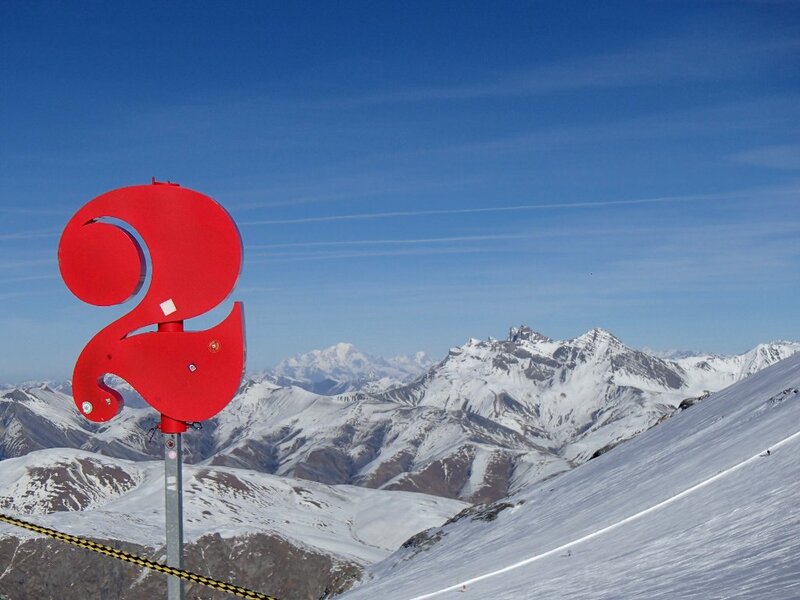 We decided to go to Les Deux Alpes as it's high up, has a glacier (you can ski there in summer too) and a good selection of (open!) pistes for those of us who are still learning. As usual, it was a bit of a last minute booking. We couldn't find a package deal that suited (a lot were doing different days due to Christmas day being a weekend) so we booked flights (from a sensible airport, yay), bus transfer, and a room in Chalet Ruby. This was definitely the best chalet experience I've had so far. Lovely chalet, great people, bedrooms with actual floorspace, very generous portions of good food, log fire, and a hot tub for relaxing after a day on the slopes. It's located at a quiet end of the town, but without being far away from the lifts, shops and nightlife. Highly recommended. Ah yes, the skiing. I put myself in ski school again, for 5 of the 6 mornings. The only snow at resort level was artificial on the nursery slopes, so each day started by getting a lift up and ended with a lift back down. I'm not sure what happened, but something really clicked and I finally feel like I'm not a complete beginner/liability. By midweek I was happily skiing red runs without complaining too much about the steepness, although my technique is nowhere near perfect - I need to work on getting my weight forward, not hunching up so much, and the start of my turns do have a habit of still being a bit snowploughy. But I was much more confident, (relatively) faster and most importantly, really enjoying myself. Our instructor also started to get us using our poles, which again just seemed to make sense when I actually remembered to do it. 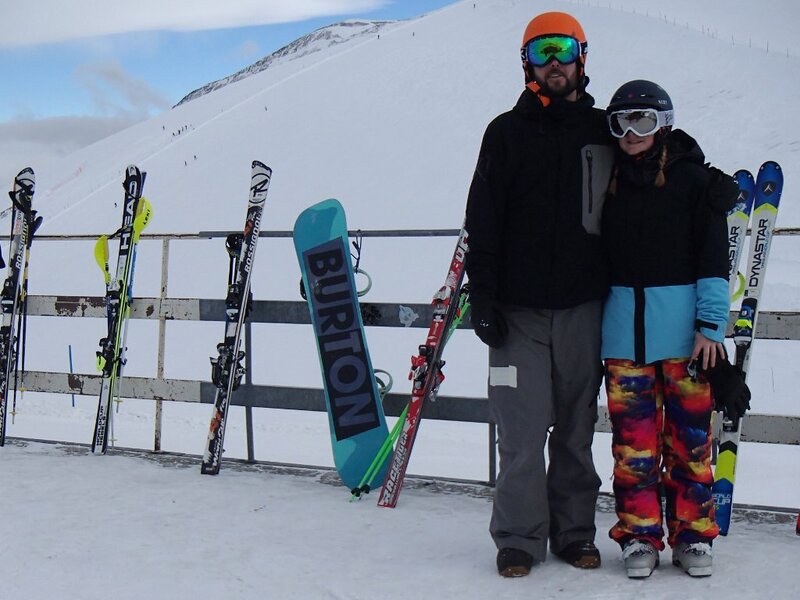 My (early) christmas present from Jon was a pair of disgustingly colourful ski trousers. And while they happened to be the ones I was first drawn to in the shop purely on looks, they also turned out to be the ones that ticked most of the boxes in terms of features. Hurrah! At least one random person on the slopes complimented me on them, hah. I can't say I fully tested them out as it was mostly sunny and relatively warm, but they kept my legs toasty on the one day where we did have snow and cold winds (my breath was freezing on my Buff when we were sat on chairlifts), but without causing me to overheat the rest of the time. As well as finding the confidence to ski red runs, I ended the week with a couple of runs down the baby snowpark, complete with small jumps! There was a double jump at the start, with a photographer who missed me (boo), and another jump a bit further down just before some hanging objects you could hit as you skiied past. I got a little bit of air AND landed upright on my skis. I did have lots of falls earlier in the week, including bashing my knee up failing to get off a chairlift properly on day one. Oops. How wonderful! I was hoping to get to go skiing last year as I haven't been since I was a teenager in rural Canada. My eldest son got to ski in the Alps on a school trip this year, so I suppose that's a consolation. LOVE those skiiing trousers! Wishing you all the best for a wonderful and adventurous 2017! Looks awesome! I haven't been skiing for 20 years, I'd love to try it again. Your trousers are cool, the brighter the better!